This article is about the 1950 film. For the 1961 television series, see The Asphalt Jungle (TV series). The Asphalt Jungle is a 1950 film noir and heist film directed by John Huston. Based on the 1949 novel of the same name by W. R. Burnett, it tells the story of a jewel robbery in a Midwestern city. The film stars Sterling Hayden, Louis Calhern, Jean Hagen, James Whitmore, Sam Jaffe, and John McIntire, and also features Marilyn Monroe in one of her earliest roles. A critical success, the film was nominated for four Academy Awards. In 2008, The Asphalt Jungle was selected for preservation in the United States National Film Registry by the Library of Congress as being "culturally, historically, or aesthetically significant". When criminal mastermind Erwin "Doc" Riedenschneider (Sam Jaffe) is released from prison after seven years, he immediately goes to see a bookie named Cobby (Marc Lawrence) in an unnamed Midwest river city (almost certainly Cincinnati), who arranges a meeting with Alonzo Emmerich (Louis Calhern), a high-profile lawyer. Emmerich listens with interest to Doc's plan to steal jewelry worth a million dollars or more. Doc needs $50,000 to hire three men—a "box man" (safecracker), a driver, and a "hooligan"—to help him pull off the caper, to "operate", in the criminal jargon used in the film, and each man could be called an "operator", although this term was not used in the film. Emmerich agrees to provide the money to "operate", and then suggests that he, himself (not one or more fences) assume the responsibility for disposing of the loot. Doc first hires Louie Ciavelli (Anthony Caruso), a professional safecracker. Ciavelli only trusts Gus Minissi (James Whitmore), a hunchbacked diner owner, as the getaway driver. The final member of the gang is Dix Handley (Sterling Hayden), a friend of Gus. Dix explains his ultimate goal to Doll Conovan (Jean Hagen), who is in love with him. His dream is to buy back the horse farm that his father lost during the Great Depression. Dix, however, just keeps losing his ill-gotten gains betting on the horses via Cobby. This job would pay him the amount he needs. During the meticulously planned crime (an 11-minute sequence in the film), the criminals carry out their work in a calm, professional manner. Ciavelli hammers through a brick wall to get into the jewelry store, deactivates a door alarm to let in Doc and Dix, and then opens the main safe in minutes using home-brewed nitroglycerine ("the soup"). Unfortunately, the explosion somehow sets off the alarms of nearby businesses and brings the police to the scene more quickly than expected. On their way out, Dix has to slug an arriving security guard, who drops his revolver, which discharges and wounds Ciavelli in the belly. The men get away unseen, but a police manhunt quickly begins. Ciavelli insists on being taken home by Gus. Dix and Doc take the loot to Emmerich, who confesses he needs some more time to raise the cash they had expected. In reality, he is broke. He had sent a private detective named Bob Brannom (Brad Dexter) to collect sums owed to him, but Brannom returned only with excuses. Emmerich then plotted to double cross the others with Brannom's help (for an equal share). Emmerich suggests to Doc that he leave the jewelry with him, but Doc and Dix become suspicious. Brannom then pulls out his gun. Dix is able to kill Brannom, but not without being wounded himself. Dix wants to shoot Emmerich as well, but Doc persuades him not to. Doc tells the lawyer to contact the insurance companies and offer to return the valuables for 25% of their value. Emmerich disposes of Brannom's body in the river, but the police find the corpse, along with the list of people who owe Emmerich money, and question him. He lies about his whereabouts, and after they leave, hurriedly calls Angela Phinlay (Marilyn Monroe in her first important role), his beautiful young mistress, to set up an alibi. Under increasing pressure from Police Commissioner Hardy (John McIntire), a police lieutenant named Ditrich (Barry Kelley) (who had previously protected Cobby for money) beats the bookie into confessing everything in a vain attempt to save himself (he is later arrested for corruption). With the confession, Hardy personally arrests Emmerich, managing to persuade Angela to tell the truth. Emmerich is permitted to leave the room for a minute and commits suicide. Gus is soon picked up, then attacks Cobby at the jail. When the police break down Ciavelli's door, they find they have interrupted his funeral. That leaves only Doc and Dix, who separate. Doc asks a taxi driver to drive him to Cleveland. They stop at a roadside diner, where Doc puts money in the jukebox to watch an attractive young woman dance. In the time it takes for the song to play, two policemen come and recognize him. He offers no resistance, musing that the two minutes for the song defeated him. Doll gets Dix a car, then insists on going along. When he passes out from loss of blood, Doll takes him to a doctor, who phones the police to report the gunshot wound. Dix regains consciousness after a plasma transfusion and escapes before they arrive. With Doll, he makes it all the way back to his beloved Kentucky horse farm across the Ohio river from Cincinnati. He stumbles into the pasture and collapses and dies. The film was an adaptation by director John Huston and screenwriter Ben Maddow of the 1949 novel by W. R. Burnett. It was backed by the major film studio Metro-Goldwyn-Mayer, which allowed the production a relatively free hand. Both Huston and war hero star Sterling Hayden were members of the Committee for the First Amendment, which opposed the blacklisting of alleged communists active in the film industry during the Red Scare. The PCA's main concerns with the script were the detailed depiction of the heist and the fact that the character of the corrupt lawyer Emmerich seemed to cheat justice by killing himself. Neither the studio nor the censors interfered significantly with the script, however, and both the heist and the suicide featured in the final cut. According to MGM records the film made $1,077,000 in the US and Canada and $1,060,000 overseas resulting in a profit of only $40,000. This brutally frank story of crime and punishment in a Midwestern city was directed by two-time Academy Award winner, John Huston—son of the late Walter Huston. John's pictures are usually grim (The Treasure of the Sierra Madre), but always dramatic and exciting. This time he exposes the behind-the-scenes details of the robbery of a jewelry store... This picture is packed with stand-out performances... There's a beautiful blonde, too, name of Marilyn Monroe, who plays Calhern's girl friend, and makes the most of her footage. Louis Calhern as the big lawyer who tries to pull a double cross and muffs it is exceptionally fluid and adroit and Sterling Hayden is sure-fire as a brazen hoodlum who just wants to go back home. Likewise Sam Jaffe does wonders as a cool-headed mastermind, James Whitmore is taut as a small 'fixer' and John McIntire is crisp as a chief of police. But, then, everyone in the picture—which was produced incidentally, by M.G.M.—gives an unimpeachable performance. If only it all weren't so corrupt. The review aggregator Rotten Tomatoes reported that 96% of critics gave the film a positive review, based on twenty-five reviews. The Asphalt Jungle was one of the most influential crime films of the 1950s. 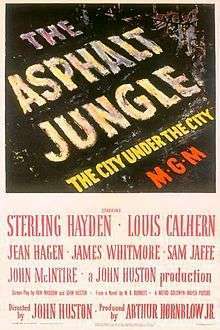 The film spawned a television series, The Asphalt Jungle, starring Jack Warden, Arch Johnson, and William Smith (billed as "Bill Smith"), which ran for thirteen episodes in the spring and summer of 1961 on ABC. The series, though, resembled the film in name only, except for one episode, "The Professor," which was constructed as a sequel to the feature. Aside from this one-shot, however, none of the characters in the film appeared in the television scripts, and the plots were devoted to the exploits of the major case squad of the New York Police Department. One of the most notable features of the series is the theme song written by Duke Ellington. Burnett's novel The Asphalt Jungle was the basis of the western film The Badlanders (1958) directed by Delmer Daves, as well as the blaxploitation film Cool Breeze (1972), directed by Barry Pollack. The Asphalt Jungle instigated the crime thriller subgenre of caper films. The 1955 French film Rififi, which critics such as Leonard Maltin have labeled as the best heist film ever, drew much inspiration from The Asphalt Jungle. In 2008, The Asphalt Jungle was selected for preservation in the United States National Film Registry by the Library of Congress as being "culturally, historically, or aesthetically significant". The movie was the subject of a film colorization lawsuit and controversy in France. Turner Entertainment Company entered into an agreement with the French television channel, La Cinq, to broadcast the colorized movie. John Huston's heirs objected, filing a lawsuit against broadcasting this version. In November 23, 1988, The Asphalt Jungle was prohibited from being broadcast in France. On July 6, 1989, La Cinq won on appeal, broadcasting the film on August 6, 1989, the day after the anniversary of the death of Marilyn Monroe. Finally in Turner Entertainment Co. v. Huston, on May 28, 1991, the Court of Cassation cancelled the judgment delivered on July 6, 1989, stating that colorizing the movie transformed the original artwork enough to potentially transgress the author's moral rights. Huston's heirs had sought to block the broadcast of the colorized version. 1 2 The Eddie Mannix Ledger, Los Angeles: Margaret Herrick Library, Center for Motion Picture Study . 1 2 3 4 Naremore, James (2008). More Than Night: Film Noir in Its Contexts. Berkeley: University of California Press. pp. 128–129. ISBN 0-520-25402-3. ↑ Meyer, David N. (1998). A Girl and a Gun: The Complete Guide to Film Noir on Video. Avon Books. ISBN 0-380-79067-X. ↑ The Asphalt Jungle at Rotten Tomatoes. Last accessed: February 11, 2010. 1 2 Schwartz, Ronald (2001). "The Asphalt Jungle (1950), The Badlanders (1958), Cairo (1963), and Cool Breeze (1972)". Noir, Now and Then. Westport: Greenwood Press. p. 85. ISBN 0-313-30893-4. ↑ The Asphalt Jungle at The Classic TV Archive. Last accessed: July 2, 2008. ↑ Taradji, Nima (1998). "Colorization and 'Moral Rights' of the Artist". taradji.com. Retrieved 6 February 2015. Wikimedia Commons has media related to The Asphalt Jungle (film).